Markzware, a privately-held company based in Santa Ana, California, is the leading publisher of quality assurance, data conversion, and workflow solutions for the international graphic arts, printing, publishing, and digital multimedia industries. Markzware B.V., located in Rijswijk, the Netherlands, is the company’s headquarters for activities in Europe, the Middle East, Africa, and Asia. FlightCheck – has set the standard preflight tool in the publishing, prepress and graphic arts community worldwide as the de facto standard to manage quality control for print jobs. ID2Q – Converts Adobe InDesign To QuarkXPress – Provides QuarkXPress users a quick, easy and inexpensive solution for converting Adobe InDesign content into QuarkXPress documents. PDF2DTP – is a Markzware product family that includes an Adobe InDesign Plugin / QuarkXPress XTension that allow you to convert PDF to Adobe InDesign or QuarkXPress. Q2ID – Converts QuarkXPress To Adobe InDesign – Provides Adobe InDesign users a quick, easy and inexpensive solution for converting and migrating QuarkXPress content into InDesign documents. Easily manage all of your print jobs, save hours converting data, and avoid costly reprints with Markzware quality control tools! Markzware's ID2Q can help all those within the printing, publishing and graphic arts industries to open InDesign CC 2015 documents within QuarkXPress. This XTension is a reliable, fast-acting solution for enhanced productivity within QuarkXPress workflows. ID2Q will save professionals a great deal of time and effort, as the InDesign CC 2015 documents won't have to be rebuilt from scratch. PDF2DTP (PDF to Desktop Publishing) helps users to convert PDF files to Adobe InDesign. 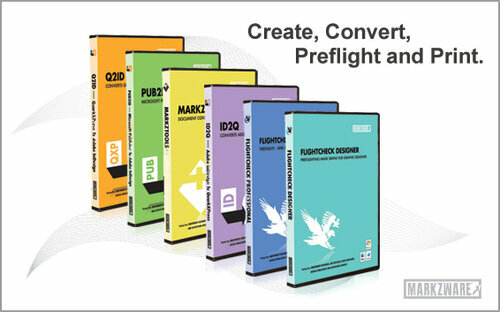 PDF2DTP is an affordable method to move PDF content to an editable format within Adobe InDesign. Once in InDesign, users can edit within a flexible and familiar environment.A single menu selection from within InDesign enables the PDF data conversion. No longer re-create documents from scratch or convert PDFs just one page at a time. PDF2DTP gives you a big head-start in converting your PDF to InDesign. MarkzTools for InDesign is an InDesign plugin that will allow you to open a higher version of an Adobe InDesign document in a lower version. For instance, an InDesign CS6 user of MarkzTools for InDesign can open InDesign CC (Creative Cloud) 2014 or open InDesign CC 2015 documents within InDesign CS6. MarkzTools can open up newer versions of InDesign documents, without IDML, and inform users which version the document is. MarkzTools users will be able to edit the InDesign CC, CC 2014 or CC 2015 documents in an earlier InDesign version. Publishers and creative professionals can simply select 'Convert InDesign Document" in the easy-to-use MarkzTools menu, to start the data conversion. MarkzTools users can also use the standard Command-O function within Adobe InDesign for document conversion.